What to cook for dinner, I hear you say. Well here is a great recipe for those crisp nights. 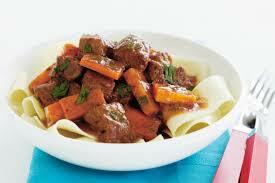 A hearty Beef and Carrot Ragout. Very simple and easy to prepare. This recipe is for a slow cooker which means all of the hard work is done at the beginning with the prep. Pop it all into the slow cooker then sit down and have a cup of tea. Enjoy! Place flour in a snap-lock bag. Add beef and shake bag to lightly coat beef in flour, shaking off excess. Heat 1 tablespoon oil in a large frying pan over medium-high heat. Cook, stirring occasionally, for 3 to 5 minutes or until browned. Reduce frying pan heat to medium. Add remaining oil and onion to pan. Cook, stirring often, for 2 minutes or until soft. Add garlic and tomato paste. Simmer, uncovered, for 5 minutes or until wine has reduced by half. Add stock, thyme and carrots. Spoon sauce over beef and stir to combine. Cover and cook on HIGH for up to 4 hours or LOW for 6 hours. Use a timer and prepare earlier. Freeze for up to 3 months (without the pasta). Try serving with mashed potato instead of pasta.